Elizabeth (population 761) is located along United States Route 20 in the hilly Northwest Illinois area. It is about 15 miles east of Galena. The town was first settled as a fort in 1825 and played a vital role in the Black Hawk War of the 1830's. One legend regarding the naming of the town states that in 1832 a group of Sauk Indians attacked the fort while the men of the town were away hunting. A lady named Elizabeth Armstrong organized the women to defend the fort and fight off the Indians. The town was subsequently named in her honor. 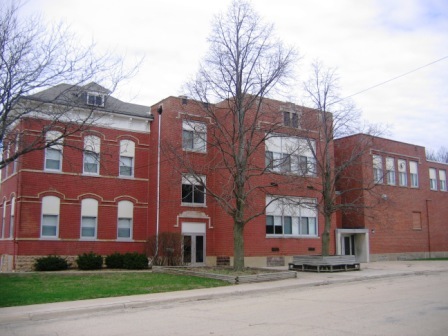 It is believed that Elizabeth residents started their high school system in the early 1900's and served the community until 1985 when they consolidated with nearby Hanover to form River Ridge High School, now located north of Hanover on Ill. Route 84. 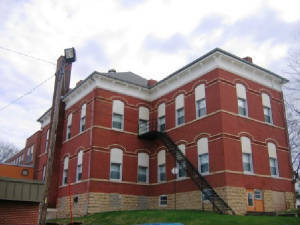 In 2003, all lower level grades from Elizabeth and Hanover schools moved into the new campus. The original Elizabeth High School building is vacant, but an annex (which was added in the 1950s) now houses the Highland Community College West Campus. To view the Elizabeth High School complex as it looked in 1973 click on the following link: http://vintageaerial.com/photos/illinois/jo-daviess/1973/LJO/27/26 . School song: "Sing for Dear Old Betsy High"
Sing for Dear Ole Betsy High! Shout to til the anthems ring! Stand and sing the song once again! Let every loyal Terrapin sing (RAH RAH)! The school of our hearts always! Terrapins, Terrapins, are the BEST! Elizabeth High School had a very unique nickname for their athletic teams. Lynn Kloft explains that the Terrapin is a small turtle and many were found to live in the area in ponds that surrounded nearby Terrapin Ridge. 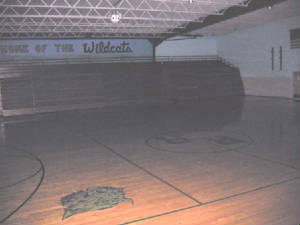 The EHS Basketball program enjoyed great success, especially in the 1950's and 1960's. The boys basketball program took home all of the school's IHSA hardware in the form of District Championships: 11 of them in all. Coach's names of many of the early teams are needed. 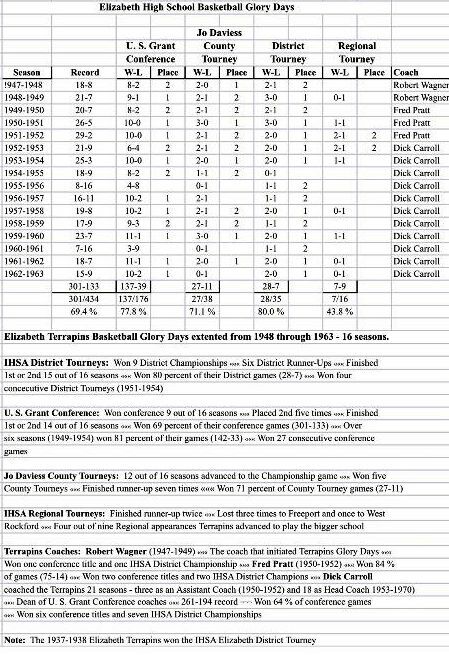 Check out the records of the Elizabeth teams of 1948-49 through 1953-54. How about a 142 - 33 record for that period which included 6 consecutive 20+ games-won seasons!! Coach Brad Albrecht led the Terrapin charges from 1972-73 until the school consolidated after the 1984-85 season. Coach Albrecht's final team at Elizabeth was his best, a Regional Champ with a 23 - 4 record! Special recognition goes to Charles See for his extensive research into the Elizabeth High School boys basketball seasons of 1946-47 through 1969-70. 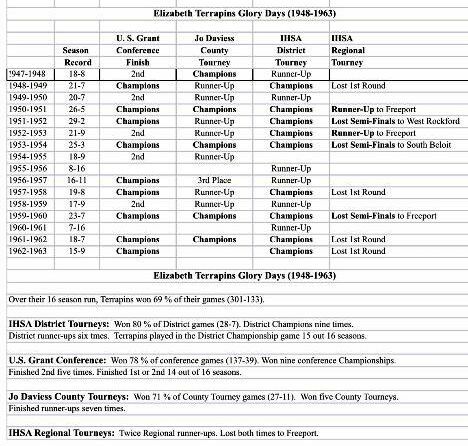 Several scores involving Elizabeth High School during other seasons were located on a web site titled "Illinois Postseason Basketball Scores" and are reprinted below. 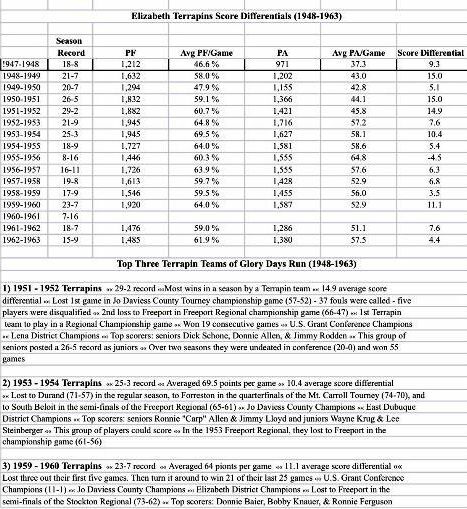 1922-23 through 1930-31 Postseason scores, records, and coach's names needed. ELIZABETH (56): Steinberger 15, Krug 12, Lloyd 11, Allen 9, Eustice 9. **Elizabeth High School Terrapins' final game. Became part of River Ridge School District in the summer of 1985. 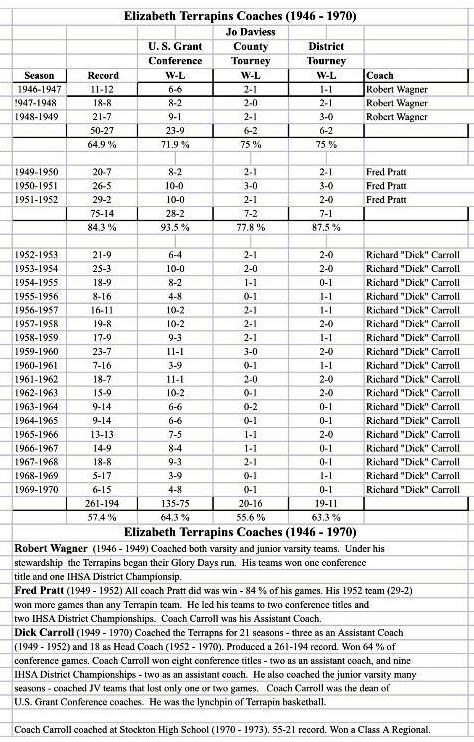 The Lady Terrapins had some nice seasons in their early years. Coach Sharon Smith may have been the only girls coach in school history. If you have this information please forward it to us. Elizabeth High School was also a great place to learn about music and compete with it as well. In back-to-back years, 1983 and 1984, Elizabeth High School's Music Program won the Class D State Championship in the IHSA Music Sweepstakes. Class D enabled the program to compete with fellow small schools in the state.